RDG Filings provides expert document conversion and filing services to individuals, publicly traded companies, mutual funds, and other parties required by law to file electronically with the Securities and Exchange Commission. We are among the top six largest filing agents in the United States, available 24 hours a day, and seven days a week to help companies and individuals meet their SEC reporting requirements. 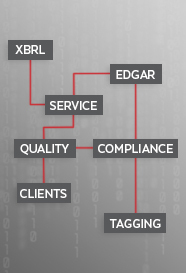 EDGAR/IDEA & XBRL Filing with the SEC is the foundation of what we do. RDG Filings has over 15 years of experience doing EDGAR filings. Our clients who have come to us from other providers have consistently been pleased with our higher level of personalized service, our quicker turnaround times, and our far more reasonable pricing structure that typically represents significant savings. One of the most important advantages of our services is that none of your documents or time-sensitive information is outsourced. Your documents will always remain securely within our offices, in the trusted care of our employees. RDG’s quality assures that your company’s filings will always be presented to the public in a clean and professional format. We invite you to view recent examples of our work by clicking on the links below.